Which numbers should you use? How high should it be? Should it be rounded? This guide has 42 tricks to help you choose the best price. Welcome to a huge resource on pricing psychology. PDF Bonus: This article is 9,368 words. Click to download the full PDF so that you can reference it later. Nothing in this world has concrete meaning. At the end of the day, price is merely a perception. Nothing more. Nothing less. In this section, you’ll learn pricing techniques that will subconsciously influence people to perceive your price to be lower — all without changing the inherent magnitude. You can influence people’s memory for your price. When people compare your price to a reference price, you can influence them to pull a lower price into that comparison. With such a hazy memory, you can influence people to recall a smaller magnitude. How? Here are some useful tactics. For the past few decades, marketers have used charm pricing — prices that end in 9, 99, or 95. When people see those positive results, they often credit the 9’s in the price. However, there’s another culprit responsible: the left digit. Why is the left digit so important? Because it anchors the perceived magnitude. “…while evaluating “2.99,” the magnitude encoding process starts as soon as our eyes encounter the digit “2.” Consequently, the encoded magnitude of $2.99 gets anchored on the leftmost digit (i.e., $2) and becomes significantly lower than the encoded magnitude of $3.00” (pp. 55). Bonus Tip: You could emphasize the new base digit by visually minimizing the digits after the decimal. Don’t overlook the auditory version of your price. It may seem irrelevant, but syllabic length influences price perception (Coulter, Choi, and Monroe, 2012). When we encounter stimuli with many syllables, we need more mental resources to process that stimuli. And that principle applies to numbers. If we expend a larger amount of mental resources to process a number, we falsely infer that the magnitude must be larger. The flipside is more important: people perceive prices to be smaller when they contain fewer syllables. Same here. But according to research…that doesn’t matter. When you read a price in written form, your brain nonconsciously encodes the auditory version (Dehaene, 1992). 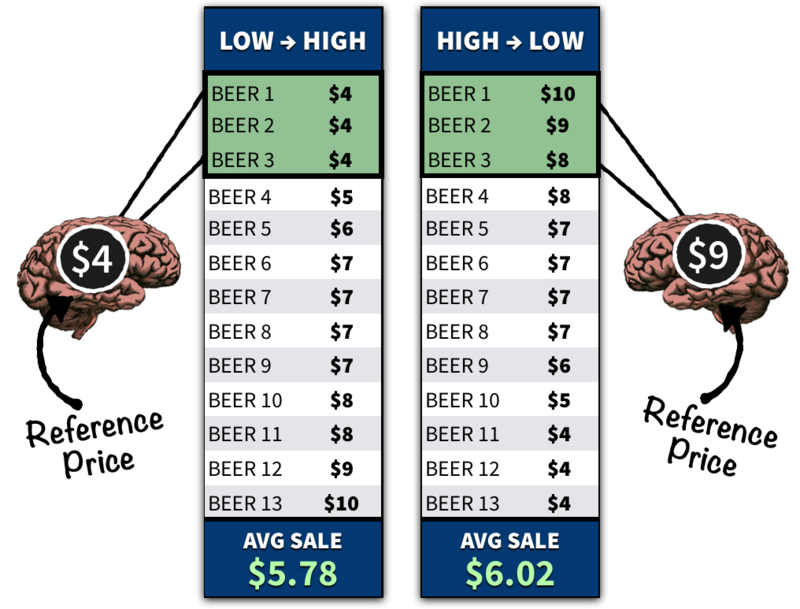 You don’t even need to verbalize the price in your mind — your brain encodes it either way. Coulter et al. (2012) found a positive relationship between syllabic length and perceived magnitude. 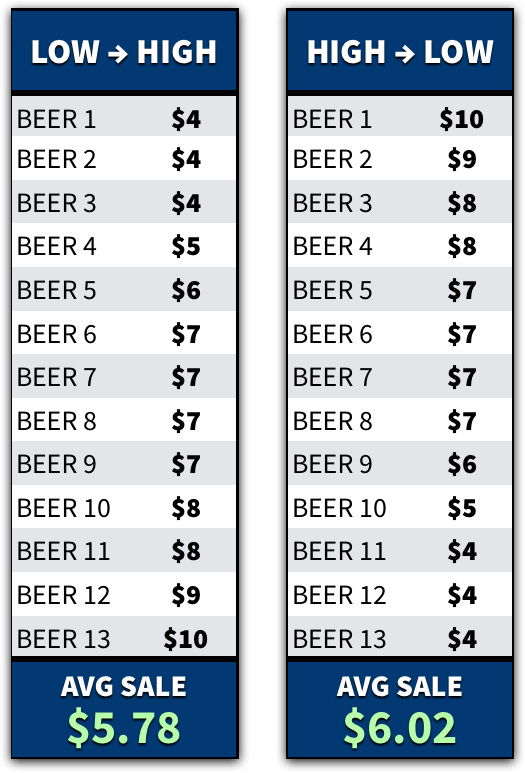 Even if two prices have the same written length (e.g., $27.82 vs. $28.16), people perceive the phonetically longer price to be higher in magnitude. Your brain has a universal conceptualization of size. Thus, there’s a blurred overlap between VISUAL size and NUMERICAL size. That’s why customers perceive your price to be smaller if you display your price in a smaller font size (Coulter & Coulter, 2005). My pricing eBook is 9,368 words. Click to download the PDF for free. In a layout, position larger elements around your price. Those elements will reinforce a smaller visual magnitude, which will reinforce a smaller numerical magnitude. The reverse works for discounts. Since you want to maximize the size of discounts, you should display those numerals in a large font size. Researchers found that removing commas (e.g., $1,499 vs. $1499) can make your price seem lower (Coulter, Choi, and Monroe, 2012). Why does that happen? Although physical length plays a role, there’s another principle involved. We already discussed it. Can you think of it? Be careful when choosing the language near your price. Certain words can taint people’s perception. For example, Coulter and Coulter (2005) presented participants with various descriptions for an inline skate. Some descriptions emphasized a “Low Friction” benefit. Other descriptions emphasized a “High Performance” benefit. When you choose the language near your price, choose words that are congruent with a small magnitude (e.g., “low,” “small,” “tiny”). If you sell products online, you should usually separate shipping and handling fees. 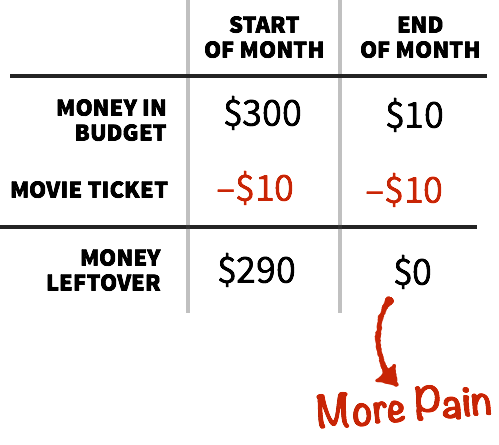 With “partitioned pricing” (i.e., separating a price into multiple components), you anchor people on the base price, rather than the total cost (Morwitz, Greenleaf, & Johnson, 1998). When people compare your price to a reference price, they’ll be more likely to pull your base price into the comparison. Hossain and Morgan (2006) tested that possibility with eBay auctions. They set up auctions for music CDs, and they analyzed different bidding structures. In the end, auctions with low opening bids (plus shipping charges) attracted more bidders and generated more revenue. Oh…and Clark and Ward (2002) found similar results with auctions for the “Charizard” Pokemon card. Likewise, when you give people the option to pay for your product in smaller increments (rather than one lump sum), you anchor people on the smaller price. Suppose that you’re selling an online course for $499. By offering payment installments (e.g., 5 payments of $99), you taint people’s comparison process. They’ll be more likely to compare your installment price ($99) to a competitor’s lump sum (e.g., $500) — a huge difference that makes your offering more appealing. But don’t get the wrong idea. People aren’t stupid. They know that comparing $99 and $500 isn’t accurate. Luckily, it doesn’t matter. People often compare reference prices subconsciously (Muzumdar & Sinha, 2005). So your installment price has a good chance of sneaking into their comparison. Similarly, you can reframe your price into its daily equivalence (e.g., $0.87/day). That framing influences people to perceive a lower overall price (Gourville, 1998). You should still make your regular price the primary focus. Simply mention the daily equivalence. That low number will anchor people toward the lower end of the price spectrum. Having trouble reframing your price into a daily cost? No worries. You can achieve the same effect by comparing your price to a petty cash expense, such as a cup of coffee (Gourville, 1999). Thomas, Simon, and Kadiyali (2007) analyzed 27,000 real estate transactions. Buyers pay more money when prices are specific (e.g., $362,978 vs. $350,000). Is it because of the negotiation aspect? If someone asks for a very specific price, wouldn’t buyers perceive less room to negotiate? That’s what I thought. But nope. Researchers ruled out that possibility. Surprisingly, the real culprit involved priming a small magnitude. Think about it. When are you more likely to use precise values? Answer: when you’re dealing with small numbers (e.g., 1, 2, 3). Due to that association, precise numbers trigger an association with small values — thus influencing people’s perception. When determining the numbers in your price, you should also consider processing fluency. Processing Fluency – The ease and speed in which we process information. When we can quickly process information, it feels good. And our brain misattributes that pleasantness to the context. That’s why you should increase the fluency of your price. This section will explain how. When designing a layout, you should position your price toward the left (Coulter, 2002). It sounds odd, but hear me out. Due to our association between “up” and “good,” priming the spatial concept of “up” can trigger associations with “good.” Meier and Robinson (2004) found that people recognized positive words faster when those words were positioned toward the top of a screen (and they recognized negative words faster when they were positioned toward the bottom). The same applies to numbers. Dehaene, Bossini and Giraux (1991) found that people conceptualize numbers on an imaginary horizontal line, with numbers growing larger from left to right. In their study, they presented participants with digits ranging from 0 and 9, and they asked participants to indicate its parity (i.e., whether it was odd or even). As expected, people responded faster to smaller numbers when using their left hand (and vice versa). In other words, people responded faster with the hand that matched the same side of their mental ruler. How does that finding relate to pricing psychology? Since we conceptualize smaller numbers as belonging on the left, positioning prices toward the left can trigger people’s conceptualization for a smaller magnitude (Coulter, 2002). However, don’t jump the gun. You shouldn’t position ALL prices on the left…only prices that people associate with the left (i.e., low prices). Conversely, you should position high prices toward the right — a position that’s congruent with a high numerical magnitude. That congruence will increase processing fluency. Lastly, we focused on horizontal direction. But we also associate numbers with vertical direction — with smaller numbers positioned toward the bottom. You could probably achieve the same effect by positioning low prices toward the bottom (or bottom-left). The first two ads offered unlimited toppings — an economically better deal. However, people evaluated the other two ads more favorably. It seems absurd. But rest assured, psychology can explain it. Because of those associations, exposure to two numbers (e.g., 2 and 6) increases processing fluency for the sum (e.g., 8) and product (e.g., 12). 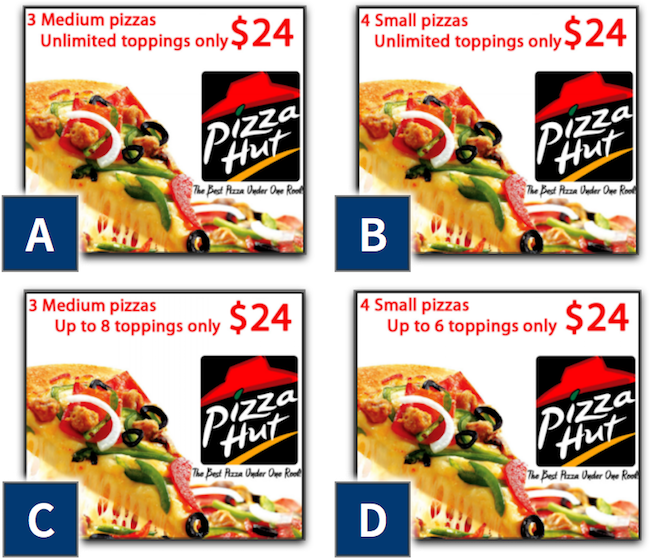 When the ads contained multiples of $24 (e.g., 3 and 8), participants could process the price of $24 more easily. The price simply felt right. They misattributed that ease and pleasantness with the attractiveness of the offer. One caveat: include two — and only two — multiples. If your price is $12, a wide assortment of multiples (e.g., 2, 3, 4, and 6) will reduce fluency. 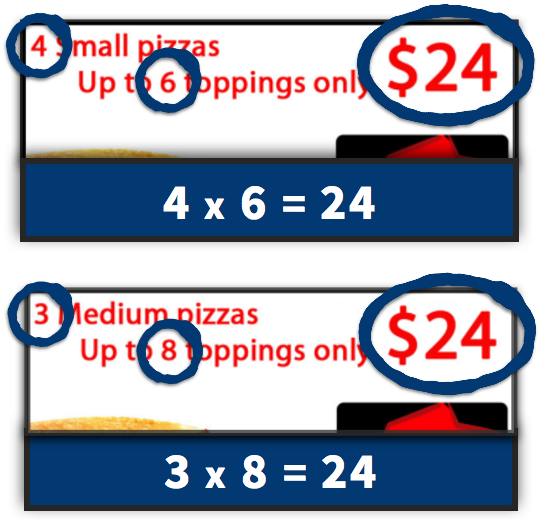 To increase fluency of $12, use two multiples that result in the sum (e.g., 6 + 6) or product (e.g., 4 x 3). One aspect to consider is the “roundedness” of your price. Round prices (e.g., $100) are processed fluently, whereas non-rounded prices (e.g., $98.76) are processed disfluently. Could one choice generate more sales? Researchers think so. The researchers also found the opposite to be true. Consumers need to use more mental resources to process non-rounded prices. So those prices seem more fitting with rational purchases. Despite the direct evidence, I’ll propose a caveat. Even if your purchase context is emotion-based, you should still avoid rounded price intervals (e.g., $100, $5,000). People assume that those prices are artificially higher, as if they were plucked from thin air (Janiszewski & Uy, 2008). So where can roundedness help? That principle can help you determine whether to add cents to your price. If your purchase is based on EMOTION, then leave out the cents. If your purchase is based on RATIONALITY, then add some cents. This tactic is bizarre. But a surprising amount of research supports it. The principle is implicit egotism (Pelham, Carvallo, & Jones, 2005). We all possess an innate self-centeredness. We subconsciously gravitate toward things that resemble ourselves — including the letters in our name or the numbers in our birthday. Some researchers suggest that we make important life decisions based on that principle. People named Dennis are more likely to become dentists, and people named Louis are more likely to live in St. Louis (Pelham, Mirenberg, & Jones, 2002). If you need to give someone a custom price quote, it might not hurt to slightly adjust the price to match that customer’s name or birthday (perhaps after a quick glance at their Facebook page). What should you display first: your product or your price? To answer that question, Karmarkar, Shiv, and Knutson (2015) gave participants $40 in shopping money. The researchers used fMRI to analyze their brains while they shopped for online products. Turns out, the first exposure — price vs. product — influenced the criteria that people used when deciding whether to buy. When products were displayed first, participants based their purchase decision on the product qualities. When prices were displayed first, participants based their purchase decision on the economic value. If you sell luxury products, you want people to base their decision on your product qualities. You don’t want them to consider the economic value. Thus, for luxury products, show the product, and THEN show the price. Roger Dooley gave the example of Tiffany’s jewelry. 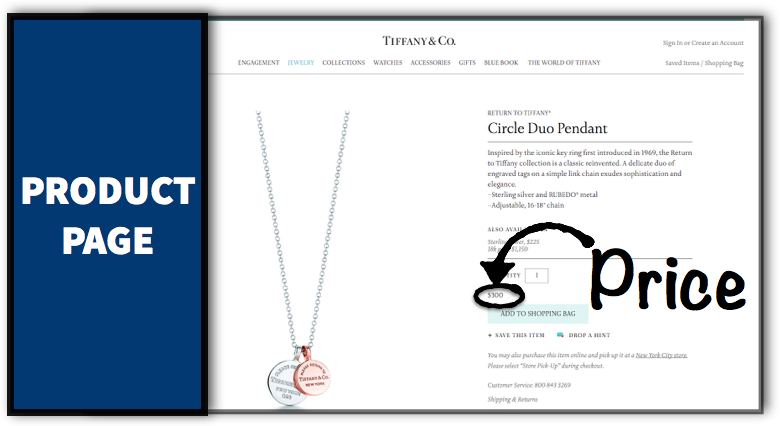 On their website, they emphasize the jewelry before revealing the price. Even when they reveal the price, they visually deemphasize it — as if it’s unimportant and negligible. The opposite is true for utilitarian products (e.g., a pack of AA batteries, USB drive, flashlight). Participants were more likely to buy those products if they encountered the price first. With that exposure, people were more likely to appreciate the economic value of the purchase. Puccinelli et al. (2013) found that men are more likely to buy products when prices are displayed in red. That red price became a focal point of attention – and thus the only information that men used to evaluate their purchase. More importantly, because men associate red prices with savings, they relied more heavily on that belief. Those findings also align with my research on color. In my color article, I explain why red increases arousal (which triggers heuristic processing). The past two strategies helped you lower the perceived magnitude of your price. However, you can achieve the same effect by maximizing the perceived magnitude of reference prices. This section offers a few tactics. 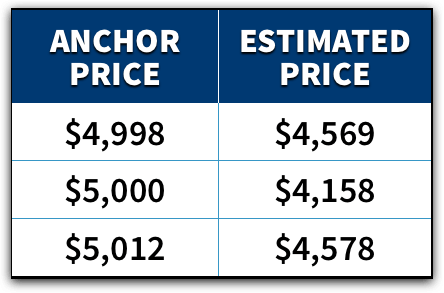 Due to anchoring, it’s no shocker that sellers get more money by starting negotiations with a high initial offer (Galinsky & Mussweiler, 2001). That high number establishes an anchor point, pulling the final settlement closer. When participants were given precise values ($4,998 and $5,012), they estimated the TV’s actual price to be closer to that range. When the suggested price was rounded ($5,000), participants believed the actual price to be much lower. That insight works particularly well in eBay auctions. When creating your auction, you can generate more revenue by establishing a high reserve price — a price that needs to be met in order for the item to be sold. Higher reserve prices anchor people toward the higher end of the price spectrum, resulting in more revenue (Kamins, Dreze, & Folkes, 2004). Given our tendency to assimilate toward an anchor point, could exposure to high prices — even for unrelated products — anchor people toward the higher end of the price spectrum? Would those people pay a higher price for your product? Nunes and Boatwright (2004) tested that possibility. On a boardwalk in West Palm Beach, they sold music CDs. Every 30 minutes, the adjacent vendor alternated the price of a sweatshirt on display — either $10 or $80. What happened? You guessed it. The sweater’s price anchored people toward the respective ends of the price spectrum. When the price of the sweatshirt was $80, shoppers paid higher prices for the CDs. If you’re selling items on eBay, you might want to mention some of the other items you have for sale (the more expensive items, of course). The takeaway? Even if customers don’t consciously notice your numerical anchor, they just need to be exposed to it. If you run an online store, you could simply mention your total number of customers near your price. When people generate their reference price, that high number will trigger an anchoring effect (and their reference price will be higher). If you’re launching a new (more expensive) version of your product, how should you price the old product? Some businesses lower the price to gradually phase it out of the market. Surprisingly, though, that strategy is often the wrong approach. Baker, Marn, and Zawada (2010) suggest raising the price of your old product. By raising the price, you raise people’s reference price (thereby enhancing the perceived value of your new product). You’ll be releasing the new product into more favorable conditions. If you lower the price of your old product, you set yourself up for failure. You reinforce a lower reference price, which makes your new product seem more expensive. You can influence customers to choose a more expensive option if you sort products by descending price (i.e., from high to low). When consumers evaluate a list of products, they use the initial prices to generate their reference price. If the initial prices are high, customers generate a higher reference price. When customers use that reference price to evaluate the options, all of the options seem like a better deal. As humans, we focus on losses. Whenever we choose an option, we lose benefits from the options that we didn’t choose. And that hurts. 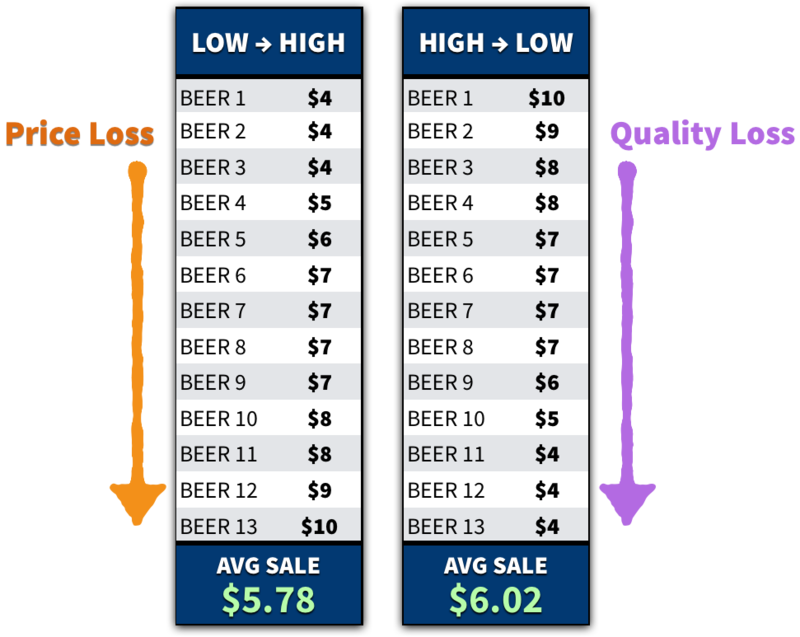 Depending on your pricing sequence (i.e., low to high vs. high to low), customers perceive different losses when they scan down the list of products. But here’s a caveat: those customers need to associate price with quality. Without that association, the effect diminishes. Suk, Lee, and Lichtenstein (2012) conducted some follow up studies (including a lab study with pens), and they found similar results. So the findings should generalize to other contexts (e.g., eCommerce products). For example, based on results from numerous A/B tests, you might be able to increase revenue by arranging pricing plans from most expensive to least expensive. Give up? Research shows that the second presentation is more effective (Bagchi & Davis, 2012). However, there are two conditions. If the first item is PRICE, customers focus on COST. If the first item is QUANTITY, customers focus on BENEFITS. 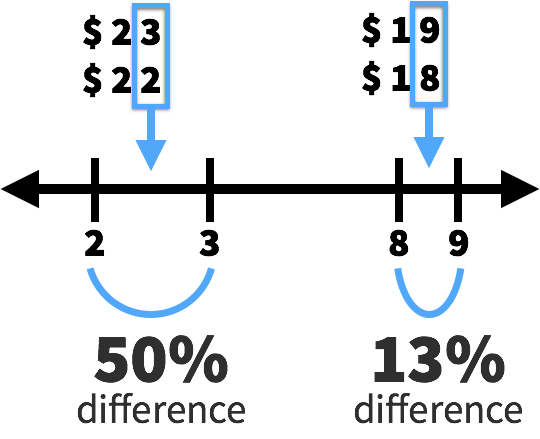 When the quantity is larger, an anchoring effect occurs. Customers anchor on the high quantity (e.g., 70), and they falsely infer that the price is an attractive deal. The previous strategies either (a) minimized the perceived size of your price or (b) maximized the perceived size of reference prices. This next strategy will help you maximize the perceived distance between your price and a reference price. When you compare your price to a higher price, people are more likely to buy your product because they feel less motivated to research the decision (Urbany, Bearden, & Weilbaker, 1988). They’ve already done their homework. But here’s a neat trick to optimize that comparison. If you visually distinguish your price from a reference price (e.g., using a different font color), you trigger a fluency effect. Consumers will misattribute that visual distinction to a greater numerical distinction (Coulter and Coulter, 2005). That fluency effect not only works with font color, but it also works with physical distance. When your price is horizontally farther away from a reference price, people perceive a greater numerical distance (Coulter & Norberg, 2009). And don’t forget about font size. Smaller font sizes are especially effective when they’re positioned next to a larger reference price (Coulter & Coulter, 2005). At first glance, it seemed like the “print only” option was a mistake. Who would choose that option when you could choose a web and print subscription for the same price? But Ariely noticed an underlying motive. He conducted a study to test his hunch. And he was right. The “print only” option made a huge difference. Without the “print only” option, people couldn’t accurately compare the options. 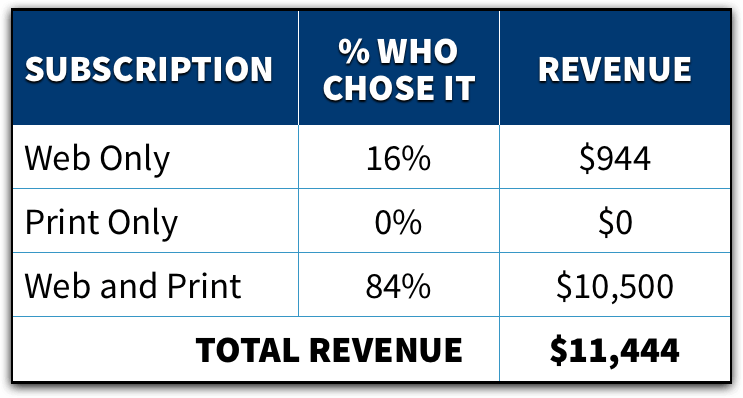 How much should you pay for a web and print subscription? Who knows. Most people chose the web option because it was cheaper. When you offer different versions of your product, people will naturally compare those options. To guide people toward the more expensive version, you can take the same approach. By adding a similar, yet worse, version of your expensive product, you influence the comparison process. Suddenly your expensive product becomes more appealing. Even if you reduce the perceived magnitude of your price, customers might be stagnant. You should give them a nudge. This section will teach you some psychological tactics that can motivate people to buy. You’ll learn how to (a) reduce the “pain” that customers associate with paying and (b) use discounts properly. Each time we purchase something, we feel a sense of pain — often referred to as the “pain of paying” (Prelec & Loewenstein, 1998). Considering those two factors, you can see why Uber — a ride-sharing service — revolutionized the taxi industry. In traditional taxi rides, the saliency of payment is very high. You see a meter constantly rising. Each minute evokes an increasingly painful sensation. Plus, at the end of the ride, the taxi driver makes you pay by cash or credit card. So. Much. Pain. Uber is different. No visual meter. No physical payments. Everything is automatically charged to your card. Much less pain. Credit card processing is one tactic to reduce the pain of paying, but you can reduce that pain in other ways too. This section will give you a few ideas. The pain of paying can be triggered pretty easily. In fact, the dollar sign in your price can remind people of that pain, and it can cause people to spend less (Yang, Kimes, & Sessarego, 2009). But don’t get too trigger-happy. Before you start removing dollar signs, you should consider the overall clarity of your price. Oftentimes, you need a dollar sign to indicate that your number is, indeed, a price. In those cases, don’t risk clarity by removing the dollar sign. Only use this tactic in formats where customers will expect a price to appear (e.g., restaurant menus). When possible, your customers should pay before they use your product or service. Prepayments benefit all parties involved. For one, you won’t be delivering your product or service without being compensated. You’ll be more likely to get paid. Pretty helpful. Second, people will be happier with your product. When people prepay, they focus on the benefits they’ll be receiving, which numbs the pain of paying. If they’ve already experienced the benefits of your product, their payment becomes significantly more painful (Prelec & Lowenstein, 1998). That insight can be helpful with monthly subscriptions. If you charge customers monthly payments, you should charge them at the beginning of the month (and frame your message in a forward-looking manner). Avoid sending receipts at the end of a month (or summarizing the previous month’s payment). You’ll just be rubbing salt in the wound. To reduce the pain of paying, consider bundling your product. When you offer a packaged product, people can’t attribute a specific dollar value to the items within your bundle. Ideally, the added product should be hedonic, rather than utilitarian. Since hedonic purchases trigger more guilt (Khan & Dhar, 2006), a bundle reduces that guilt, especially when you attribute the discount to the hedonic product. If you can only add a utilitarian product, then describe a hedonic use for that product. Khan and Dhar (2010) found that people were more likely to purchase a bundled lamp and blender when the description emphasized a hedonic use for the blender (e.g., making exotic cocktails) compared to a utilitarian use (e.g., making healthy shakes). You should also avoid bundling expensive and inexpensive products. Inexpensive products reduce the perceived value of expensive products. Brough and Chernev (2012) asked people to choose between a home gym and a 1-year gym membership. Roughly 51 percent of people chose the home gym — a pretty even split. However, when the researchers bundled the home gym with a free fitness DVD, only 35% of people chose it. The fitness DVD reduced the perceived value of the home gym. When describing your product, avoid references to money. Instead, mention a concept that has a much greater benefit: time. Participants were told that they could choose how much they wanted to pay — anywhere between $1 to $3. The results were clear: the “time” sign outperformed the others. Those people paid twice as much (and the sign attracted twice as many people). When writing copy, emphasize the enjoyable time that people will spend with your product. Not only will that message make your offer more appealing, but it’ll also distract people from the pain of paying. What do casino chips and gift cards have in common? They both reduce the pain of paying. By creating a separate medium between your customers’ money and their payment, you distort the perception of paying. They’ll know that they’re paying. But it won’t feel like it. Why? Researchers find that, with the presence of a medium, people are too lazy to calculate the conversion between the two currencies (Nunes & Park, 2003). So here’s a cool idea. When new customers open an account with your business, you could require them to deposit a refundable $10 into their account (to be used for your services). Since the money is refundable, customers might not give too much additional resistance. More importantly, that payment medium will distort the essence of that money. Once it enters a separate medium, it won’t feel like money (and people will be more willing to spend it). You could also strengthen that perception by referring to that money as “[Your Company] Balance” (or any name that avoids connotation with real currency). If you implement that strategy, you might also want to match customer deposits by a certain percentage. For example, if a customer deposits $10 into their account, you could match it by 10% (which would bring their account value to $11). By matching their deposits, you trigger two benefits. First, and most obvious, you incentive customers to deposit more money. Customers care about the perceived magnitude of your price (i.e., whether it’s high or low). But they also care about the perceived fairness of your price. Even if your price is low, customers could still perceive it to be unfair. Likewise, customers could still perceive high prices to be fair — depending on a few factors. Emphasize your product’s “top-of-the-line” raw material or any other cost-based input. That information will trigger a more empathetic perception of your price. You might be familiar with the paradox of choice. When more options are present, people feel less likely to choose an option. Once people choose an option, they lose the benefits offered in the other options. Because of loss aversion, they postpone their decision — especially when more options are present (because they’d be losing more benefits). That insight led to a similar finding: people are more likely to choose an option if the potential options are similar (Sagi & Friedland, 2007). If options are similar, then people will receive similar benefits with any option. So loss aversion is lower. But let’s question that insight. When the gum shared the same price, customers perceived the packs to be less similar. Paradoxically, adding a small price difference increased the perceived similarity. When two products share the same price, people can’t immediately distinguish those products. As a result, they seek out differentiating characteristics. Thus, the product differences become more salient. However, when you add a slight price difference, you reduce the need to search for differences. Customers can differentiate the products based on price. Because customers focus less attention on product differences, the two products maintain a higher degree of similarity. And that similarity makes people more likely to choose a product. If your price is $11.99, an increase to $12.99 will be less noticeable than an increase to $19.99. In theory, that concept is intuitive. Obviously people notice larger price increases. In practice, however, that principle is very counterintuitive. Since businesses avoid price increases, they save that tactic as a last resort. They wait until it’s absolutely necessary to raise their price. However, if you reach that point, then you’ll usually be desperate for revenue. You won’t be able to increase your price by a tiny amount. You’ll need to increase it by a noticeable amount. If you know that you’ll need to increase your price eventually, you should use more frequent (yet smaller) changes. Avoid waiting until the moment of desperation. 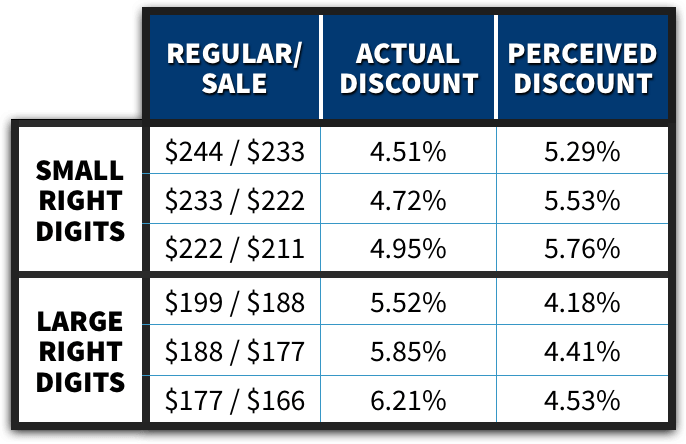 With more frequent price increases, you also avoid reinforcing a concrete reference price. If your price stays the same for years, then people will become accustomed to your price at that specific level. Once you change your price, people will be more likely to notice. You can use the just noticeable difference in other ways. Food marketers know that customers are pretty familiar with prices. So they often avoid price increases by reducing the physical size of their products (e.g., potato chip bags, candy bars, etc.). By reducing physical size, food marketers lower their costs and increase their margin. More importantly, they increase their revenue without raising their price (or alerting people to negative changes). If you downsize your product, reduce the size of all three dimensions — height, width, and length — by an equal amount. Consumers are less likely to notice a change in all three dimensions (Chandon & Ordabayeva, 2009). If not used properly, discounts can actually harm your business. In fact, some people suggest that you should never use discounts. That advice is pretty extreme. You can use discounts…you just need to use them properly. Where can you go wrong? If used too frequently (or too deeply), discounts can make customers more price conscious moving forward. They’ll keep waiting for the next discount. Discounts can also lower the reference price for your product, causing people to buy less in the future (because your price will seem high). Reducing the frequency and depth of discounts can help. However, this section will give you a few other pricing tactics. Earlier, you learned that people can perceive different magnitudes for the same price, depending on the context. 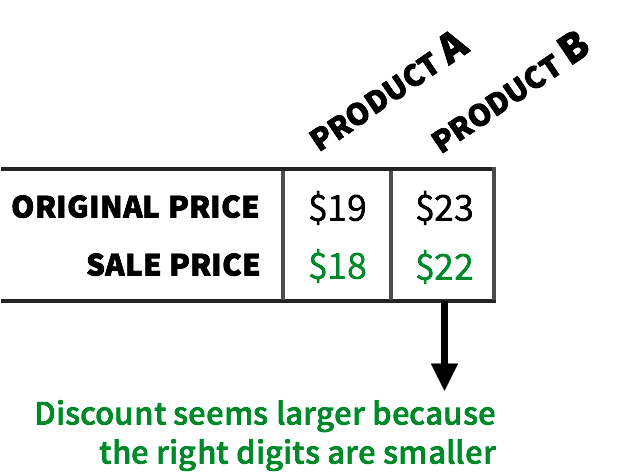 When you offer discounts, you want to maximize their perceived size. That way, people feel like they’re getting a better deal. Consider a $50 blender. Which discount seems like a better deal: 20% off vs. $10 off? Do the math. Both discounts are the same monetary value. However, one discount has an advantage. In both cases, you’ll be choosing the discount with the higher numeral (which inflates the perceived magnitude of your discount). To maximize the effectiveness of a discount, explain why you’re offering it. By providing a reason behind your discount, you reinforce the temporary and provisional nature of it. Since the price is abnormal, people will be less likely to incorporate it into their internal reference price. Earlier, I explained how people associate precise numbers with small values. Thus, you can influence people to perceive large prices to be smaller when you use precise numerals (Thomas, Simon, and Kadiyali, 2007). With discounts, however, you want to maximize the perceived magnitude. That’s why choosing discounts with precise numbers can hurt you. Those precise numbers will make your discount seem smaller. Indeed, Thomas and Morwitz (2006) found that people perceived the difference between 4.97 – 3.96 to be smaller than the difference between 5.00 – 4.00 (even though the difference is roughly the same). To maximize the perceived size of your discount, use rounded values. Customers should be able to compute the discount more easily. Soster, Gershoff, and Bearden (2014) found evidence for a bottom dollar effect. Bottom Dollar Effect – We feel the pain of paying in accordance with the depletion of our budget. We feel more pain when we have fewer funds in our budget. Suppose that you have a monthly budget of $300. If you spend $10 on a movie ticket, you will feel more pain toward the end of the month — when your budget is nearing depletion. This effect influences willingness to pay and purchase satisfaction (Soster, Gershoff, & Bearden, 2014). You’re more likely to buy a product (and be satisfied with it) when you have more money left in your budget. Biswas et al., (2013) found that customers perceive a larger discount when the sale price is positioned to the right of the original price. The researchers dubbed it the subtraction principle. They also found that it alters the perception of discounts. When a sale price appears to the right, customers can calculate the discount more easily — enlarging its perceived magnitude. Discounts can be harmful. When you end a discount, you might cause people to (a) choose a competitor’s product or (b) wait for the next discount. But when and why do those harmful effects occur? The answer lies in the positioning of your brand — whether it’s high quality or low quality (Wathieu, Muthukrishnan, & Bronnenberg, 2004). In other words, when premium brands retract discounts, customers will still be focusing on price. Thus, they’ll consider price more heavily in their purchase. Since the product is already priced high, the perceived cost will seem even larger. If you’re competing on price, feel free to give discounts. However, if you’re competing on quality, you should avoid discounting (so that you deemphasize price). Instead, remain focused on the attributes and quality of your product. 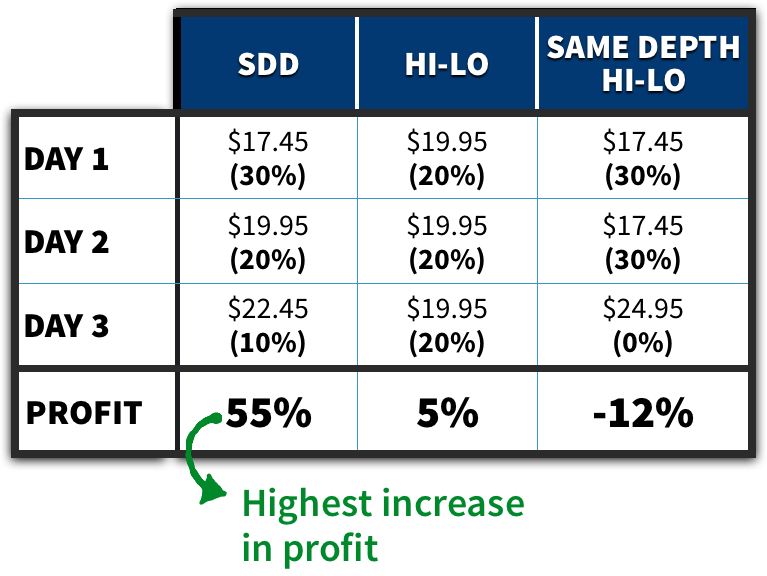 Marketers generally use two types of pricing strategies: hi-lo pricing and everyday low pricing (EDLP). The researchers even conducted a field study. Over a 30-week span, they alternated between three strategies for a $24.95 wine bottle stopper at a kitchen appliance store. The researchers found no detrimental effects on store or brand image. If your regular price and sale price share the same left digit, your discount will seem larger if the right digits are small (less than 5). Based on numerical cognition, we compare numbers in relative terms. All else equal, a $10 discount will be more appealing for a $50 item — compared to a $500 item — even though the absolute discount is the same (Tversky & Kahneman, 1981). Thus, the perceived magnitude will seem larger for small numbers, compared to larger numbers. Assuming that the left digit remains the same in the original and sale price, a discount will seem larger when the right digits are smaller. Did you trudge through the entire article? Then you’re a brave soul, my friend. And you deserve a pat on the back. I spent a ton of time researching and writing, so I hope you found the insights helpful. Did you skip to this conclusion? No worries. The article is pretty beastly. That’s why I created a PDF version — so that you can reference it later. Instead of reiterating the pricing strategies, I want to end with one final tactic — the most important tactic in this list. 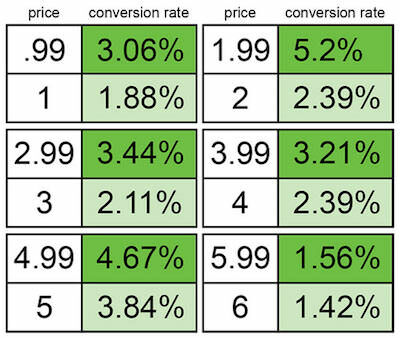 If you still have trouble justifying your price to customers — even after implementing the strategies in this article — then you might not have a pricing problem. You might have a problem communicating the value of your product. Instead of adjusting price, adjust your value proposition. Improve the perceived value of your product or service. Why would customers enjoy it? Oftentimes, you can solve your pricing problem by communicating value more effectively. 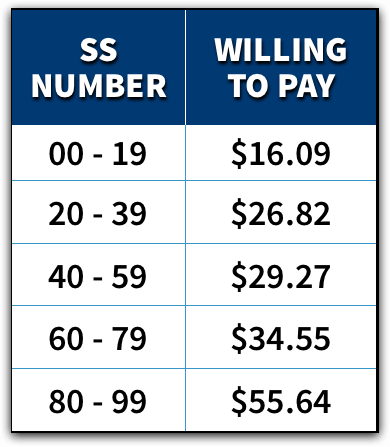 With that tactic — and all of the other psychological pricing strategies in this article — you should be able to justify your price more easily.